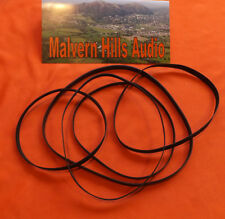 A SET OF 6 FLAT CROSS-SECTION RUBBER DRIVE BELTS FOR CASSETTE DECKS 65 - 95mm. A set of 24 Flat Cross-Section Drive Belts for use on most popular Cassette Decks & Other Audio Devices. A set of 24 belts. A selection of Six Drive Belts for use on most popular Cassette Decks. Aiwa AD-WX 808. A set of 2 X Drive Belts for. Ideal for refurbishing and repair. 2 x Flat cross-section Belts. A set of 12 Flat Cross-Section Drive Belts for use on most popular Cassette Decks & Other Audio Devices. / Flat belts and for a cassette deck belt kit Link Disabled ?. fsoo=1&fsop=1&query=cassette belt&saprchi=&saprclo=&sid=47199399&sofp=0&srchdesc=y">Belts. A46.00 mm. Length: 144 mm. 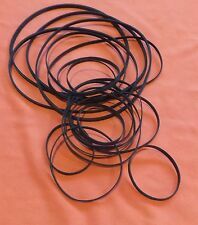 (A selection of Ten Drive Belts for use on most popular Cassette Decks. -283 mm.Long). A 97.00 mm. / Flat belts and for a cassette deck belt kit Link Disabled ?. fsoo=1&fsop=1&query=cassette belt&saprchi=&saprclo=&sid=47199399&sofp=0&srchdesc=y">Belts. (Length 305mm.). A 80.00 mm. / Flat belts and for a cassette deck belt kit Link Disabled ?. fsoo=1&fsop=1&query=cassette belt&saprchi=&saprclo=&sid=47199399&sofp=0&srchdesc=y">Belts. (Length 251mm.). A set of 20 Flat Cross-Section Drive Belts for use on most popular Cassette Decks & Other Audio Devices. A set of 20 belts. 53 mm. x 3.50mm. DIAMETER FLAT DRIVE BELT FOR CASSETTE DECKS, DVDS, 8 TRACKS. A 53.00 mm. / Flat belts and for a cassette deck belt kit Link Disabled ?. fsoo=1&fsop=1&query=cassette belt&saprchi=&saprclo=&sid=47199399&sofp=0&srchdesc=y">Belts. Belt Cross Section - Flat. TK = Thickness. BF = Belt Length Folded. TL = Total Belt Length. A 113.00 mm. (Length 355 mm.). Belt Cross Section - Flat. Compatible Model: 1700. Product Type : Belt Kit. - 1 Week to UK. - 3 Weeks to the Canada, USA, Australia. - 6 Weeks to Asia. EAN: 689821766106. If you do not receive your item after. / Flat belts and for a cassette deck belt kit Link Disabled ?. fsoo=1&fsop=1&query=cassette belt&saprchi=&saprclo=&sid=47199399&sofp=0&srchdesc=y">Belts. A 94.00 mm. A 72.00 mm. / Flat belts and for a cassette deck belt kit Link Disabled ?. fsoo=1&fsop=1&query=cassette belt&saprchi=&saprclo=&sid=47199399&sofp=0&srchdesc=y">Belts. A 79.00 mm. Belt Cross Section - Flat. A selection of 15 x Square Section Drive Belts & 10 x Flat Section Belts for use on most popular Cassette Decks & Other Audio Devices. wide- varying from approx. PIONEER PEB-183/PEB-22. 4/PEB-296 TT-7 FLAT BELT. / Flat belts and for a cassette deck belt kit Link Disabled ?. fsoo=1&fsop=1&query=cassette belt&saprchi=&saprclo=&sid=47199399&sofp=0&srchdesc=y">Belts. A 62.00 mm. Belt Cross Section -Flat. Content: 2 Square Belts 1 Flat Belt. Compatible Model: TC-188SD. Product may differ from original but is compatible with original. - 6 Weeks to Asia. - 3 Weeks to the Canada, USA, Australia. - 1 Week to UK. Compatible Model: 1721L. Product Type : Belt Kit. - 1 Week to UK. - 3 Weeks to the Canada, USA, Australia. - 6 Weeks to Asia. EAN: 689821766120. If you do not receive your item after. 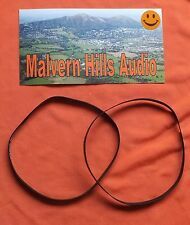 4 Flat Audio Drive Belts 59.5 ×5mm×.65mm £14 Free Post. Condition is New. Dispatched with Royal Mail 1st Class. A 37.00 mm. / Flat belts and for a cassette deck belt kit Link Disabled ?. fsoo=1&fsop=1&query=cassette belt&saprchi=&saprclo=&sid=47199399&sofp=0&srchdesc=y">Belts. (Length 116 mm.). 81 mm.x 5.50mm. 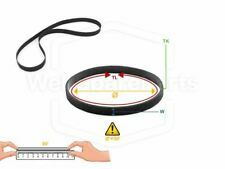 DIAMETER FLAT DRIVE BELT FOR CASSETTE DECKS, DVDS, 8 TRACKS. A 81.00 mm. Belt Cross Section - Flat. A selection of Eight Drive Belts for use on most popular Cassette Decks. A main drive belt for use on. Belt Cross-section is Flat. Ideal for the refurbishing and repair of the above. Compatible Model: X-2000 SD. Content: 1 Flat Belt. Product may differ from original but is compatible with original. - 6 Weeks to Asia. - 3 Weeks to the Canada, USA, Australia. - 1 Week to UK. If you do not receive your item after. Teac R-888X. 4 x Belts -. 2 x Square Section. 2 x Flat Section. 53 mm. x 4.00mm. 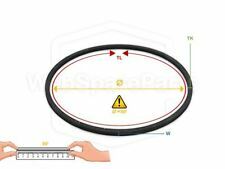 DIAMETER FLAT DRIVE BELT FOR CASSETTE DECKS, DVDS, 8 TRACKS. A 53.00 mm. Belt Cross Section - Flat. A 103.00 mm. / Flat belts and for a cassette deck belt kit Link Disabled ?. fsoo=1&fsop=1&query=cassette belt&saprchi=&saprclo=&sid=47199399&sofp=0&srchdesc=y">Belts. Belt Cross Section - Flat. Note: Belts shown in picture may not be the actual belt size - they are for illustration purposes only. Sony TC-WE425. 2 x Square Section. 2 x Flat Section. Supplied complete with 4 x Alcohol cleaning pads for cleaning belt path & pulley of old belt residue. A Two Belt set for the Aiwa. Cassette Deck. Note: picture shown is not of actual belts - it is a representation only. Aiwa AD-F 370. A set of 2 X Drive Belts for. Ideal for refurbishing and repair. 2 x Flat cross-section Belts. (A selection of 10 Drive Belts for use on most popular Cassette Decks. -288 mm.Long). Aiwa AD-WX 909. A set of 2 X Drive Belts for. Ideal for refurbishing and repair.